* Flowers that add style to your home. Looking for flower bouquets? Then try this link. Or would you like to create your own earthy display for organic flowers? These are made around the natural colours, shapes, textures and repeating patterns of nature - fern leaves, bark, rope, and natural fibres may be included too. and this page has tips on floral presentation. 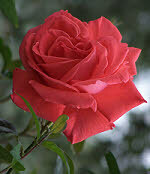 A new page on exotic flowers will be published soon. My father delighted in giving his specially grown garden flowers to friends and family. And the flower growing advice below will encourage you to pick organic flowers from your own garden. 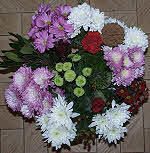 But when you have your flowers already in hand see this link for preparing and presenting flowers. Flower gardeners can extend the range of organic flowers and length of the growing season by using a greenhouse, conservatory or polytunnel, and by providing heat. single stemmed inflorescences born on a solitary stalk - Allium 'Globemaster' or ornamental onion, and Rudbeckia - 'Black-eyed Susan' or 'Coneflower'. Find more on how these forms are arranged and used in flower displays here. See what professional florists say you should do to make your flowers last. Dried Seed Heads:- Honesty (Lunaria), Poppy capsules, Dipsacus, Burdock. The fruiting capsules of Iris foetidissima open to reveal red seeds. Intricate repeating patterns are a feature in displays of organic flowers. Seed heads of umbel flowers (e.g. fennel, wild carrot) and of sunflower, add a natural repeating structure to your display of organic flowers. 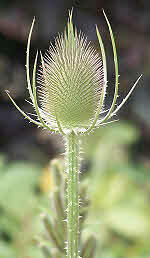 Teasel was once used to comb wool fibres straight before spinning. These spiky heads for the look and feel of old fashioned cottage garden industry. Dried Flower Heads:- Knapweed, Thistle, Artichoke - these will help you to create an unusual and somewhat regal display of organic flowers. ^ Create a display of organic flowers from the top.